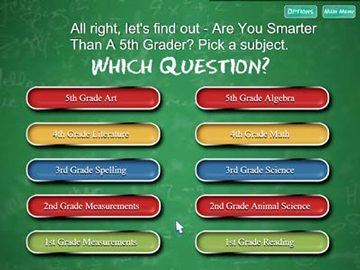 Home | Download Games | Smarter Than A 5th Grader? Class is in Session  how much have you forgotten since grammar school? Step up to the podium and put your smarts on the line to see if you're smarter than a 5th grader! Fast forward to the next round with the help from your classmate! 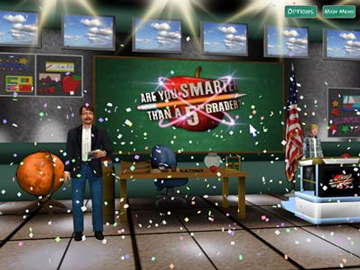 Jump right into the game show action with Are You Smarter Than A 5th Grader? 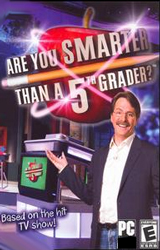 Enjoy game show excitement - just like the show, from the classmates' peer pressure, to Jeff Foxworthy's wisecracks. Test your knowledge with 28 tough grade school subjects with over 3,000 challenging questions, which you can answer with the help from your 5 classmates. Drop Out of the game and admit defeat by saying; "I am NOT smarter than a 5th grader" This is the only time when dropping out of school is cool!